Today's rates for Reserve and Collect are..
Douro, Danube, Rhine, Rhone, Nile, Irrawaddy, Mekong - some of the world's most iconic rivers. But which one is right for you? Our River Cruise Specialists can advise you on what's special about each of these rivers and many more. The choice of river cruise lines can seem quite overwhelming. Do you choose to cruise with a company you've heard of or is there another river cruise line out there that would be perfect for you? We work with every river cruise line so whatever your questions, we can advise on the one that would be perfect for you. 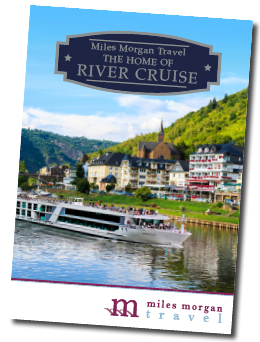 To discover our best ocean and river cruise offers plus much more, have a flick through our latest brochure. Contact one of our experienced River Cruise Specialists who can help select the perfect ship and itinerary for you. "On a Saga river cruise, you’ll have time to soak up the atmosphere, explore the sights and take in the beauty of the places that you visit. They know cities like Vienna, Prague and Budapest shouldn’t be rushed, that’s why, on some cruises, they include stays at hotels that have been carefully chosen for their great locations close to the sights. Saga offers an excellent choice of ships, from intimate vessels carrying 50 passengers to larger ones that carry up to 200. Let us here at Miles Morgan Travel recommend the right one for you." "I was lucky enough to sample a Uniworld river cruise ship recently and I could see straight away why they are multi award winning. I have seen many river cruise ships but the Uniworld ships are truly unique. Their boutique river cruises in Europe are all-inclusive, but it was their attention to small detail that really blew me away! Their ships have a stylish air inspired by the rivers upon which they cruise, a blend of old-world elegance, the latest technological innovations, and ultra-luxurious amenities." Stay up to date with all our latest news, expert advice from our Travel Specialists and the very best travel offers. 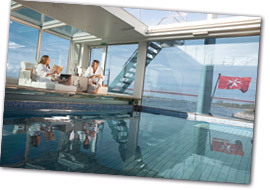 Read the latest offers in our new Ocean Cruise Travel Talk brochure, available free online. All prices on our website are subject to availability and will be confirmed at the time of booking.